Shopping for Suicide Squad Wallets? Hold your valuables in style with this Suicide Squad Taskforce X Chain Wallet! Designed with textured synthetic leather, this tri-fold wallet features 3 vertical card slots, a clear ID window, and a cash pocket. To complete the look, outside the wallet sits the Task Force X emblem and inside is embossed with the Suicide Squad title. 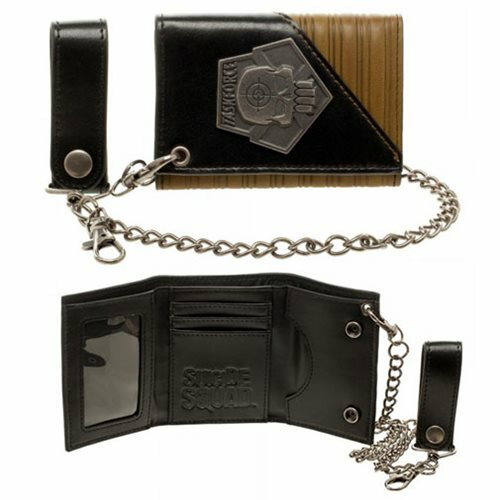 For added security, this wallet features a snap button clasp and a 15-inch long chain with keeper loop. This wallet measures about 4-inches long x 3-inches tall when closed and measures 8 3/4-inches long x 4-inches tall when open. Made from synthetic leather. Ages 14 and up.